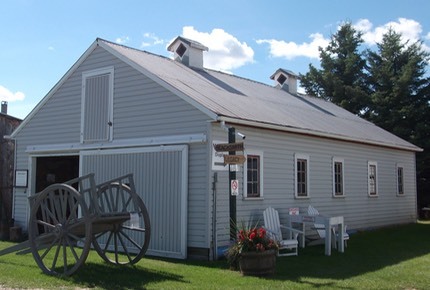 This building came from the Baron family farm east of Stony Plain and was donated to the museum by Eileen and Hilton Baron in 2000. It was built in 1956 and was used as a hog barn until 1989. At that point it was converted into a garage and tool shed and used until 1999. From 1999 until 2012 it was used as a machinery repair shop for the museum staff and volunteers. 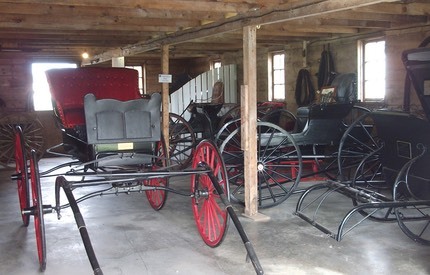 It was then converted into a livery stable to display a beautifully restored buggy, Doctor’s cutter and four seat sleigh as well as our collection of tack and harness and other horse and oxen related artifacts.